Crimping Tool is used to conjoin two pieces of metal by deforming them. Crimping is done by placing the ends of the wires in a connector and crimp with the help of a crimping tool. 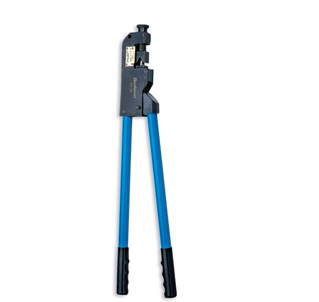 Crimping Tools are used to create crimps in the network cables and phone cables to join the RJ-45 and RJ-11 connectors to the both ends of either phone or CAT5 cable. We, at Customer Delight Trading, are offering a wide range of remote controlled and manual Crimping tools that can be used in a number of industrial applications. We procure them from reliable and reputed manufacturers. The Crimping Tools that we offer are manufactured in high-tech manufacturing facilities, using latest technology and machinery. We also send them for quality check and offer only those tools to the market that match up to our quality standards. Approach us to obtain Crimping Tools in UAE at reasonable prices. Crimping tools for non insulated terminals. For cable lugs from 16 to 120 mm2. Adjustment by section screw. Aluminium alloy handles.